Picture may differ from actual product, there can be accessories and parts not supplied with the actual product. Interest-free loan in cooperation with Aizdevums.lv. Loan maturity 3 months, amount up to 4500 €, down payment of 0%, GPL 0%. We offer to buy the graphics card MSI GeForce RTX 2070 with 8 GB GDDR6 RAM. This graphic card is intended for especially powerful computers for ensuring the maximum graphic performance of desktop computers allowing to play the most demanding 3D games (Battlefield 3, Metro 2033, Crysis 2, ,Witcher 2, etc.) with high resolution at the picture quality settings close to maximum. The capacity of this card ensures improved performance for graphic and video editing tasks with PhotoShop, SonyVegas, AdobePremiere etc. applications that are capable of utilising the picture processing acceleration functions provided by the latest GPU. In order to utilise the advantages provided by this card it will be necessary to equip the computer with a powerful power supply unit (~800W) and a four core processor with the clock frequency of at least 3GHz. This graphic card has oneHDMI port. HDMI is among the most modern ports if we speak about connecting TVs and the latest generation monitors. The main advantages of HDMI in comparison to DVI and D-SUB are a thin cable which permits to transfer a high quality digital picture and also the multichannel sound signal is transmitted via the same cable. HDMI is compatible with DVI if you buy an extra transition or a cable, however the possibility to transmit also sound is lost in this case. 3 X DisplayPort ports for this graphic card provide a possibility to connect the latest Dell, Philips, NEC, HP, Benq and certain Samsung monitors. 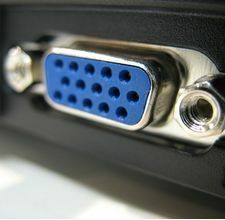 DisplayPort is currently not very widespread, but it permits to connect several monitors from a computer via a single cable by using a series connection. DisplayPort is not compatible with DVI and HDMI. GPU or the video card processor. This parameter determines whether the video card model is AMD Radeon or FirePro, NVIDIA GeForce or Quadro. This is the main performance indicator of the graphics card because it indicates the model of this card. The performance of cards of the same model is very similar and usually very different from the cards of another model. The main difference is the manufacturer. NVidia produces GeForce series cards and AMD produces Radeon series cards. There are considerable differences between both series, GeForce cards have more successful (more stable) drivers, which improve the compatibility of these cards with games and operating systems reducing the image defect (artefact) and the cases of "hanging" to the minimum. Radeon cards usually are cheaper and consume less energy (they are technologically superior), however there might be problems with drivers and the support of games. The choice between Radeon or GeForce series is the question of preference, similar to the choice between AMD or Intel CPU, and not always there is 100% rational justification behind it, therefore we recommend to base your selection criteria just on the games that you want to play in the near future and to find a video review in YouTube (the graphic card model + the game title) that will demonstrate exactly how the particular card handles the relevant game. The result will be obvious and usually quite close to what you get when you buy the particular or similar model card. For making the choice easier for our customers has marked the graphic cards (models) that are the best choice for playing all the newest games at a reasonable quality level with a green tick "recommended". GPU speed or the graphic drive speed (MHz) indicates the clock frequency at which the most important component of the video card, i.e. the video processor, operates. The higher the drive speed, the more powerful the video card. The performance of the video card is also determined by the memory volume, type, bits and the drive model, therefore you should verify the capacity compliance of the other components upon buying a video card with a powerful drive. This filter is intended for the segmenting of graphic cards based upon their essence. Each card is capable of performing the tasks for which it is intended. More powerful cards can perform new tasks plus the tasks of all the preceding cards (except the 3D Graphics/CAD cards whose application is specific). Home Cinema - Cards intended for upgrading used computers for enabling the watching of HD video and using the connection plugs of an additional monitor or TV set. These cards will not be powerful enough for graphics tasks and games. Casual Gaming - the "cheap" graphics cards with acceptable performance. In most cases it is worth buying this card only if you have decided to buy something more powerful than HomeCinema with a possibility to play elementary 3D games just sometimes. PowerGaming - these cards are the most popular models and will be able to handle any newest game at a good quality level; they are also intended for improving the speed of operation of the beginner's level video editing and graphics tasks. PowerGaming cards have the best price/performance ratio. Extreme Gaming - These cards are intended for the users who have decided to seriously enjoy 3D games and want to achieve the best quality and are prepared to pay for it the corresponding amount. An additional advantage presented by the cards of this level is the considerable performance improvement in the video editing and image processing applications. 3D graphics/CAD - These are professional cards intended for architects, 3D designers, engineers and graphics artists for considerable improvement of the speed of the image processing. These cards do not provide any performance improvement for games. The number of bits of the video card RAM determine what amount of information the video card memory can handle within a single clock cycle. A higher number of bits indicates higher performance of the video card. The RAM capacity of the video card. This is an important parameter if you want to play games of high resolution or work with a high resolution monitor. A higher memory capacity means better performance and the support to higher resolution. Currently 1GB is the optimum capacity of the video memory. The type of the RAM of the video card determines the operation speed of the video card. The currently available video cards have DDRII, GDDRIII or GDDR4 memory. GDDR4 memory is the fastest memory type. Two types of cooling are available, i.e. a radiator and a ventilator. The radiator based cooling is implemented without any moving parts (ventilator), therefore the video card does not emit any noise. The ventilator based cooling is more efficient, however, the video card emits certain noise during the computer operation. D-SUB is the classic (analogous) connection plug of monitors, projectors and other external video devices. This standard is gradually disappearing from the market leaving the space for much higher quality HDMI or DisplayPort (digitālajiem) plugs. HDMI is the digital image and sound transmission standard that allows to connect a TV set, monitor or projector supporting HDMI to the computer via the HDMI cable. DisplayPort digital connection for the transmission of the image and sound via a single wire at a high quality level. Contrary to the HDMI, this connection allows to connect several external monitors to the computer via a single connector. Description - The much anticipated return of MSI's iconic dual fan GAMING series. This masterpiece provides you premium design with magnificent and smooth RGB light effects on the outside. - Dispersion fan blade: Steep curved blade accelerating the airflow. - Traditional fan blade: Provides steady airflow to massive heat sink below. Mastery of Aerodynamics: The heatsink is optimized for efficient heat dissipation, keeping your temperatures low and performance high. Zero Frozr technology: Stopping the fan in low-load situations, keeping a noise-free environment. Customize colors and LED effects with exclusive MSI software and synchronize the look & feel with other components. 1 click to optimize all you need for smooth gaming.